Location: Perched on edge of cliff, the massive walls of the Ahilya Fort in Maheshwar offer breath taking views of the Narmada river & the Ghats immediately below. Your host at Ahilya Fort is Prince Shivaji Rao Holkar, son of the last Maharajah of Indore. The Prince ensures that the pace of life at Ahilya Fort is leisurely, in keeping with his wish to offer his guests an oasis of calm and repose. He is a reputed chef and gourmet; author of a book of recipes from the Maharajah's palaces, he personally oversees the kitchen. The tea you drink is from an exclusive tea garden in Darjeeling; coffee from Coorg is specially roasted for Ahilya Fort's guests. 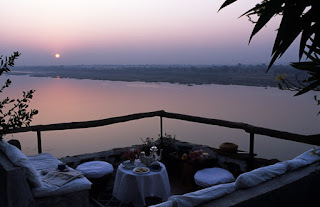 Breakfast buffet is served in the ramparts of the fort, which command a spectacular view over the kilometer-wide Narmada River-a view unchanged from that which Ahilya herself looked out over, more than two hundred years ago. The ramparts of the fort were built in the 16th century, by the renowned Mughal emperor Akbar; Maheshwar itself has been continually inhabited for some 4000 years, Guests who wish to explore the fort and its many temples walk down to the riverside, and stroll along India's most beautiful ghats-a word, which in India suggests the French "quai". Here are temples dedicated to various avatars of Lord Shiva, as well as crematory cenotaphs of the rulers of Indore. Although Maheshwar is a site revered by followers of Lord Shiva, all people who respect religion are welcome to enter any of the temples.Lunch is served in a cool covered courtyard, often a cold soup followed by pasta or light vegetarian food from Central India. Much of the food is organically grown on Ahilya Fort's nearby farm. Guests are encouraged to have a rest after the meal is over. The mid day sun is hot in the Narmada Valley, and the air-cooled rooms, fragrant with the smell of khas vetiver, provide a welcome respite. A boat trip in the afternoon takes you to Baneshwar Temple in the middle of the river, and a swim in the Narmada's cool and unpolluted waters. Baneshwar, according to ancient Hindu texts, is the centre of the universe: the axis, which connects the centre of the earth and the North Polar star, passes through this simple temple! The river is calm and peaceful now, but in the monsoons, heavy floods can bring water 20 feet over the top of the temple. A cup of tea on the boat as the sunsets leads you into the magical evenings of Maheshwar. Refreshments on the ramparts overlooking the river, which reflects the star studded sky-no pollution here, rather check lists of the constellations which stand out so clearly. Dinner is served in the garden, and can be lightly spiced Indian cuisine, or a more substantial royal "thali" dinner, with recipes from The Cooking of the Maharajahs, written by your host. Guests are encouraged to arrange the menu to suit their tastes. And so on to the next day and the next: a couple of hours spent learning about hand loom weaving. An ancient craft in Maheshwar, revived by the Holkars and now a famous and thriving cottage industry; a moon lit picnic on a boat in the Narmada, serenaded by floating musicians; occasionally a concert of classical Indian dance or instrumental music, set in a fairly-tale carved courtyard, illuminated by oil lamps; swimming in the Thousand Waterfalls, where the Narmada breaks into myriad streams, offering natural hydro massage, inner tubing down rapids, and searching for lingam stones, sacred to Lord Shiva; bird watching in the winter, catching sight of the myriad ducks and other migratory waterfowl which alight on the River; sketching, painting or photographing sunrises and sunsets. Temples and boats, colourful women and austere holy men, as the sun follows the East-West course of the Narmada; the list goes on and on, but all at a leisurely pace.The monsoon, especially in August, is unique in Maheshwar; although warm and often humid, the soft landscape is awash in shades of green, and the air fragrant with monsoon perfume-the river a rich café au lait colour, the current strong, the skies made alive with the dance of sun and cloud. An artists dream! Cool clothing is a must, a hat, too; taking account of local sensitivities, everyone is urged to dress discretely. Bring bathing suits for a swim in the Narmada, but a discrete cover up is essential. Cool clothes from the famous Maheshwari cottons are available. Ahilya Fort is an excellent base for local excursions. 60 kilometres away is Mandu, a 15th century marvel of early Islamic architecture, set amongst forests and ravines at the edge of the Malwa plateau. The architect of the Taj Mahal drew inspiration from the tomb of Mandu's ruler Hoshang Shah. His successor Ghiyassuddin expelled all men from Mandu, and lived in the Ship Palace, surrounded by 14,000 women. Today Mandu is an abandonned town, but its many buildings are in good repair and well worth a visit.Omkareshwar is the home of one of India's most famous Shiva temples, the Mandhatta Jyotirling located on an island in the middle of the Narmada River, 50 kilometers upstream from Maheshwar. Vedic texts, however, site the true Shiva shrine across the river at Mamaleshwar; the devout AhilyaBai Holkar respected these texts and endowed the Mamaleshwar shrine with land. Omkareshwar is an excellent place to experience the hustle and hum of traditional Hindu India.The Narmada itself provides an enchanting two or three day voyage by local oar and sail powered boat. The river runs through forested gorges and fertile plains; camp is made on sandy beaches, and champagne sipped under brilliant moonlight. The trip takes you by Omkareshwar and on to Bakawa, where a thriving cottage industry fashions fascinating ShivaLingams from the many-hued rocks of the Narmada. These ShivaLingams are symbols of Lord Shiva's phallic energy, and are sent to all Shiva temples throughout India. This trip ends at Ahilya Fort, its comfort and serenity welcome after the simplicity of the boat trip.The annual Sacred River Celebration takes place at Maheshwar each spring. Three days of music, dance and song take place in the fort's exquisite courtyard. Guests are able to enjoy these performances in the intimate style for which Indian cultural performances are famous. Mornings are devoted to lecture demonstrations by the evening's performers, who explain the finer points of their art. A guest moderator further enriches the experience. Maheshwar's calendar is punctuated by many Sacred Days. Perhaps the most famous and interesting is Moharrum. A Muslim observance in which both Hindus and Muslims participate. Ornate and beautiful models of a holy shrine in Iraq are made by individuals and groups; at sunset these are taken to the riverside and ceremoniously immersed in the Narmada. Ahilya Fort and Maheshwar are reached by a two-hour car ride from Indore.Indore is 45 minutes by plane from Bombay, 2 hours from Delhi, 30 minutes by plane from Bhopal, the state capitol. An overnight sleeper air-conditioned train journey connects Indore to both Delhi and Indore. The best season is October through March, with noon temperatures in the low 90s, and evenings cool; a sweater or shawl is needed only in December, January and February.